This is a traditional Indonesian recipe. The tempeh is marinated prior to cooking on the barbeque. Put the onion, garlic, red chilli (or capsicum for those who do not like chilli), lemon zest, galangal, lemon grass in a blender. Mix the spices with coconut milk and boil. Add the tempeh cubes and continue boiling until the liquid is reduced to about half. Cool down. 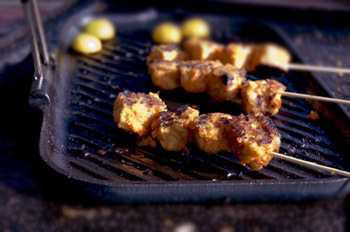 Put the tempeh cubes onto satay skewers and barbeque each side until golden brown.